Dog allergies are unfortunately quite common, as dogs tend to be prone to allergic reactions. And as your dog can’t let you know that there’s something wrong with them, it’s up to you as a responsible dog owner to notice any symptoms and to take action to fix the problem. Luckily, when it comes to allergies, it isn’t difficult to know what’s wrong. While we humans may respond to allergens in various different ways (for example, by sneezing, suffering from a runny nose and/or eyes, hives, itching etc. ), dogs almost always respond by itching. And when a dog itches, they scratch. Unfortunately though, many dog owners just assume when their dog starts to scratch that they must have fleas. But while this may sometimes be the case, more often than not, the dog is showing signs of an allergic reaction. So it’s important you don’t jump to conclusions if and when you see your dog scratching. Licking and chewing on paws. Rubbing the face on the carpet. Flea bites are the single most common cause of dog allergies. That said, it’s not the flea itself that most dogs are have an allergy to, but to the saliva that’s left in the bite wound after the dog’s been bitten. And for any poor dog that suffers such an allergy to flea bites, just a single bite can cause them real suffering and agony. It can cause an allergic reaction that results in a severe skin rash and blistering. And if just one bite can cause such a reaction, just think what a flea infestation can do to your dog. So to prevent this happening to your dog, it’s highly recommended that you treat your dog with a high-quality, topical flea medication, like Frontline every month. In most cases this will work very well to keep your dog from being infected with these nasty little parasites. And don’t forget to treat your house too. In particular, the flea larvae love to hide in flooring and skirting boards. So use an appropriate insecticide to keep your environment free of fleas. Regular vacuuming will also be a great help in this respect. One word of caution when using an insecticide is to make sure you only use one that’s completely safe for your dog and any other pets you might have. The second most common cause of allergies in dogs is reactions to constituents of their diet. The most common culprits are wheat, corn, and soy. And sadly, many commercially available dog foods contain these ingredients. Licking or chewing at the paws. Scooting (dragging their bottom along the floor). In the most severe cases you’ll even see signs of lethargy and depression in your dog. If you notice any of these symptoms in your dog, you should talk to your vet. They’ll be able to run tests to see if a dog food allergy is indeed the cause of your dog’s problems. And if it is, a simple change of diet is often all that’s needed to fix the issue. Another common cause of canine allergies is the substances that your dog inhales when they breathe. Just like with humans, pollen, molds, and dust mites can all cause allergic reactions in dogs. So if you notice your dog suffers more at certain times of year, it could be that they’re suffering from inhalant allergies. The most common symptoms include itchiness of the groin, armpits, feet, and flanks. 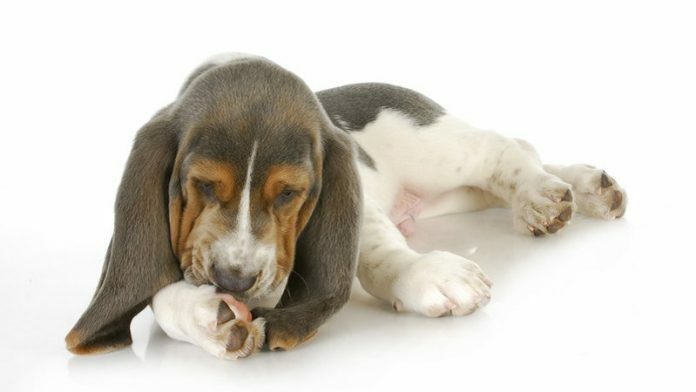 You’ll see your dog continually chewing and scratching these parts of their body. And this can result in hot spots and other infections. You may also notice your dog’s skin and coat gain a greasy texture and start to give off a pungent odor. Unfortunately, no-one has yet discovered a cure for inhalant allergies. So the best solution is just to make sure your dog avoids the allergens if you can, but this may obviously be very difficult, if not impossible. That said, you can get treatments for the symptoms. For example, steroids are effective in relieving skin irritation and itching, but they do have some negative side effects. Other, safer options are Cyclosporine A, antihistamines and fatty acids. Dog allergies may seem minor when compared to other canine diseases. But the truth is that they can cause your dog great discomfort, and can lead to other behavioral, and health problems. If your dog suffers from canine allergies, your best course of action is to speak to your vet about it, and see what they recommend to help alleviate the problem.